As we heard yesterday, Palm is running a new promotion: (nearly) all webOS apps are now half-off - a quick perusal of the App Catalog shows all sorts of $0.50 apps and even 3D PDK Games are half-off. By our rough accounting, developers get double benefits from this promotion: increased sales and their share of the revenue will be treated as though their apps were full price. In other words, if you've been waiting to purchase an app, now is the time. 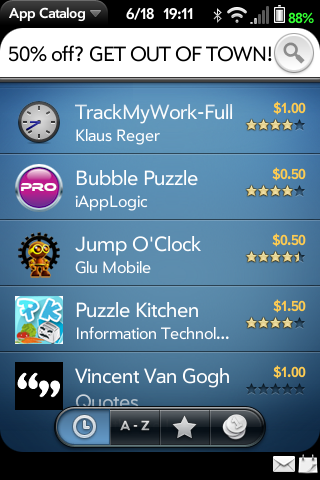 Get some great apps on the cheap and send some love to your favorite webOS developers. What apps are you going to pick up? Thanks to coolguyslim for the heads up! Update: Palm lets us know that the "Half Time" promo ends on July 9th and that there are "a handful of exceptions" - so we'll add an "Almost" proviso to the title. Proviso #2: US only, folks, sorry citizens of the world. Lastly, developers should be pleased to hear that for the purposes of the Hot Apps program, these sales will be counted at full price, per Palm's dev forum - developers see the full FAQ here.